The EV6500 is a hand-held, portable LED UV lamp with built-in white light LEDs for non-destructive testing applications like fluorescent penetrant testing and fluorescent magnetic particle inspections. 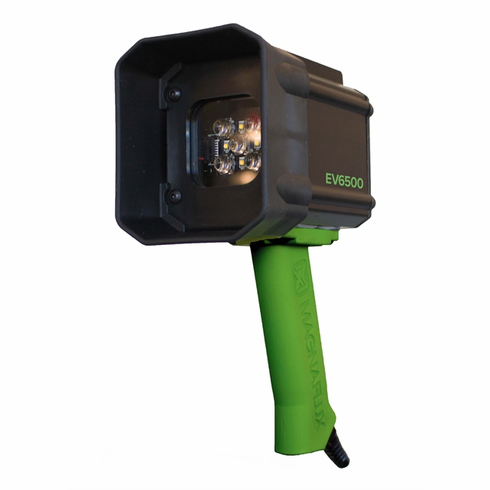 Designed with broad-beam profile for in-line and hand-held use, the EV6500 will decrease inspection time by improving indication visibility with 7,000 μW/cm2 high intensity UV-A illumination and the widest coverage area in its class. To improve NDT inspection flexibility, the EV6500 has easy-on white light LEDs for visible flaw location, eliminating the need for a separate flashlight. The white light LEDs provide a large, concentrated flood of visible light of over 150 ft-candles.